shes getting bland and boring now.. Such a “candy” look dress! She looks nice but is giving such a lollypop vibe!! She looks even slimmer than before!! She looks like high school kid, dressed up, bunking school. Sweet! 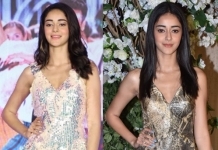 Kriti Sanon, Shradha Kapoor and Alia Bhatt don’t dress OTT, but look very boring and bland. She looks washed out. Some color on her face would have been good – given the colourful dress. Also, the silhouette isn’t doing her any favours. Here she does look skeletal esp the first pic. Somehow she seems to have aged overnight.. Doings of this dress i guess!!! I think Ami reserved this dress for Priyanka. Alia has no oomph.